EU Member States are currently negotiating Europe’s key legislation for climate action, known as the Effort Sharing Regulation. Covering 60% of the EU’s greenhouse gas emissions, the law will set binding national emission reduction targets for the 2021-2030 period for sectors such as transport, buildings, agriculture and waste. In July 2016, the European Commission published the proposal for an Effort Sharing Regulation setting the basis for negotiations between EU ministers and Members of the European Parliament. In the run up to the Environment Council in June when ministers discuss the EU’s largest climate tool, Carbon Market Watch and Transport & Environment analysed country positions in the negotiation process on the Effort Sharing Regulation and ranked them in the “EU Climate Leader Board”. This climate leader board allows citizens to hold their governments accountable for the positions they take on the EU’s largest climate tool to implement the Paris Agreement. 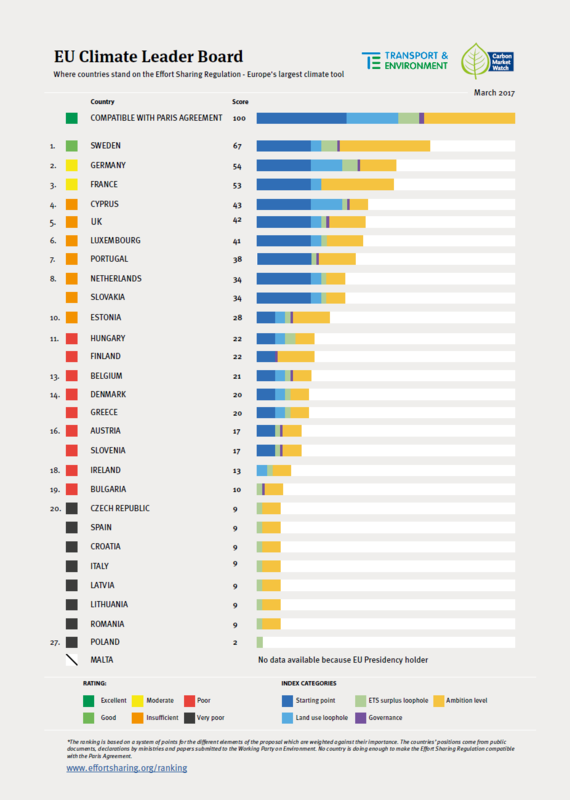 The ranking shows that only three countries in Europe push in the right direction to deliver on the Paris climate agreement. Sweden tops the list, followed by Germany and France. Sweden scores the highest among all EU countries because it advocates for closing certain loopholes in the law and is planning to achieve much higher domestic emission reductions than its 40% target proposed by the Commission. At the other end, Poland, Italy, Spain and the Czech Republic push to weaken the Commission proposal, countering Europe’s efforts to comply with the Paris Agreement. In addition, relatively wealthy countries such as Austria and Finland that have recently ratified the Paris Agreement perform poorly on ensuring that this landmark global climate deal is properly implemented in Europe. They are lobbying for the use of additional forestry credits to compensate for higher greenhouse gas emissions in other sectors, even though limiting global warming will require action in the forestry sector in addition to, not replacing, efforts to reduce fossil fuel emissions. Ireland also performs poorly. Ireland only has to reduce its emissions by 1% by 2030 compared to its 2005 levels, when taking the different flexibilities into account. Nevertheless, the country is still trying to stall reduction efforts for another decade by pushing to further weaken the Commission proposal. The country can achieve a better score by advocating for a better starting point -from which the emission reductions targets are applied- to avoid that countries are rewarded for underachieving up to 2020. Slovakia, Germany, the Netherlands, Cyprus and others advocate for improving the Commission proposal in this regard.